DIE Veneris, 25 die Januarii. Message from thence, with a Bill. Votes for Relief of French Merchants whose Goods were seized, for being imported contrary to the King's Proclamation. French Merchants examined by H. C. on Affidavits made before a Matter in Chancery. Clutterbuck, Receiver of Monies rated on the Peers in the Poll Bill. E. of St. Albans Privilege. Judges Report concerning the Canary Company Patent. The Earl of Bridgwater reported, "That the Committee have considered the Bill for settling an Estate upon Mrs. Elizabeth Pride, for the Benefit of her Children; wherein their Lordships have made some Amendments, which are offered to the Consideration of the House." Which said Amendments were read Twice, and Agreed to. Hodie 3a vice lecta est Billa, "An Act for settling an Estate in Trust, for the Benefit of Mrs. Pride and her Children." The Question being put, "Whether this Bill shall pass, with the Amendments now read?" Hodie 3a vice lecta est Billa, "An Act for confirming, explaining, and enlarging, an Act, intituled, An Act to enable John Lord Abergaveny to sell certain Lands, for the Payment of Debts, and Preferment of his Brother and Sisters." The Lord Butler reported the Bill for settling the Moiety of the Manor of Iron Acton on Sir John Poyntz, as fit to pass, without any Alteration or Amendment. Hodie 3a vice lecta est Billa, "An Act for settling the Moiety of the Manor of Iron Acton on Sir John Poyntz." Hodie 3a vice lecta est Billa, "An Act for Redress of Inconveniencies by Want of Proof of the Decease of Persons beyond the Seas, or absenting themselves, upon whose Lives Estates do depend." 1. To return them the Bill concerning Mrs. Pride, wherein the Lords have made a few Alterations, and desire the Concurrence of the Commons thereunto. 1. The Bill to confirm, explain, and enlarge, an Act to enable John Lord Abergaveny to sell Lands, for the Payment of Debts, &c.
2. 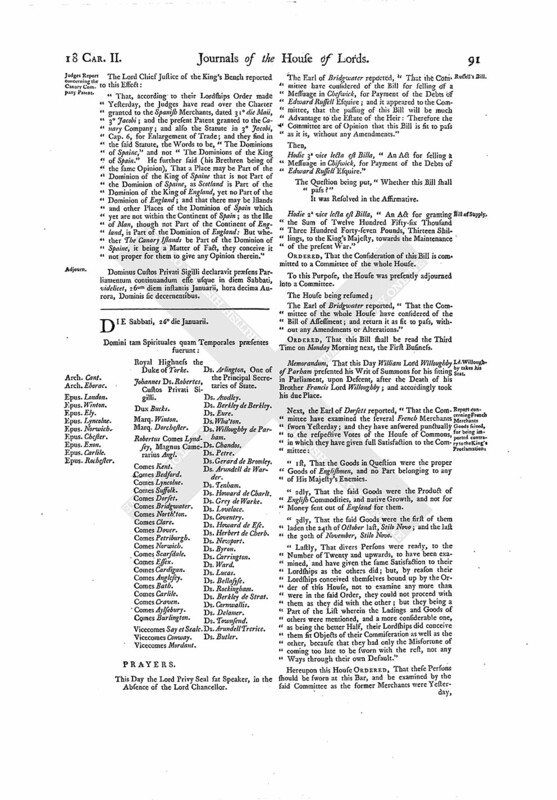 The Bill for Redress of Inconveniencies by Want of Proof of the Decease of Persons beyond the Seas, or absenting themselves, upon whose Lives Estates do depend. 3. To acquaint the Commons, that this House hath passed the Bill concerning Sir John Poyntz, without any Amendments. A Message was brought from the House of Commons, by Mr. 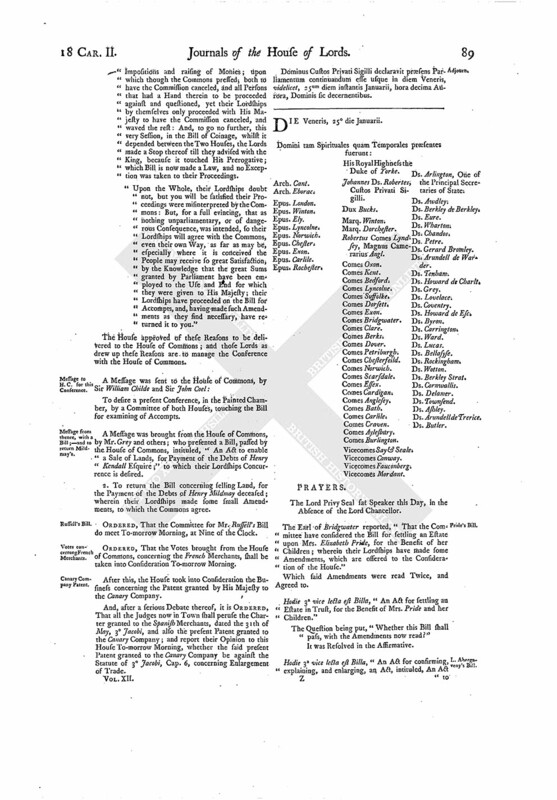 Steward and others; who brought up a Bill, intituled, "An Act for granting the Sum of Twelve Hundred Fifty-six Thousand Three Hundred Fortyseven Pounds, Thirteen Shillings, to the King's Majesty, towards the Maintenance of the present War;" to which their Lordships Concurrence is desired. Hodie 1a vice lecta est Billa, "An Act for granting the Sum of Twelve Hundred Fifty-six Thousand Three Hundred Forty-seven Pounds, Thirteen Shillings, to the King's Majesty, towards the Maintenance of the present War." ORDERED, That this Bill shall be read, the Second Time To-morrow Morning, the First Business. 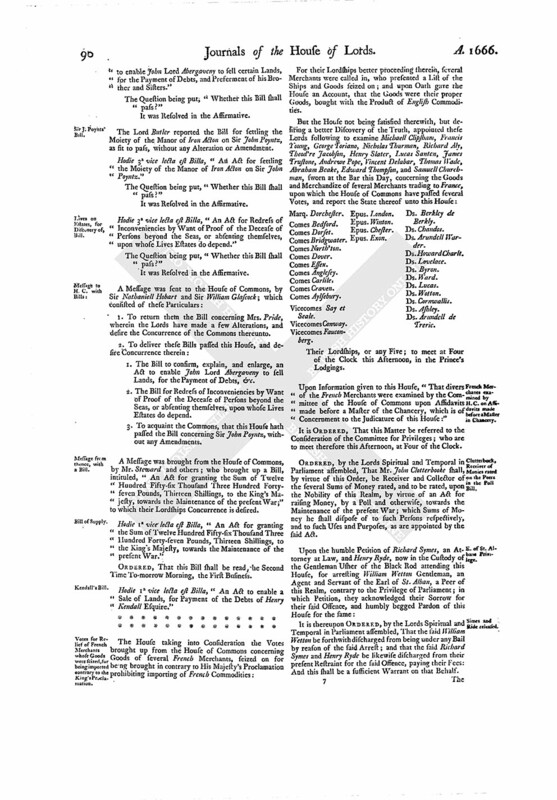 Hodie 1a vice lecta est Billa, "An Act to enable a Sale of Lands, for Payment of the Debts of Henry Kendall Esquire." For their Lordships better proceeding therein, several Merchants were called in, who presented a List of the Ships and Goods seized on; and upon Oath gave the House an Account, that the Goods were their proper Goods, bought with the Product of English Commodities. Their Lordships, or any Five; to meet at Four of the Clock this Afternoon, in the Prince's Lodgings. Upon Information given to this House, "That divers of the French Merchants were examined by the Committee of the House of Commons upon Affidavits made before a Master of the Chancery, which is of Concernment to the Judicature of this House:"
It is ORDERED, That this Matter be referred to the Consideration of the Committee for Privileges; who are to meet therefore this Afternoon, at Four of the Clock. ORDERED, by the Lords Spiritual and Temporal in Parliament assembled, That Mr. John Clotterbooke shall, by virtue of this Order, be Receiver and Collector of the several Sums of Money rated, and to be rated, upon the Nobility of this Realm, by virtue of an Act for raising Money, by a Poll and otherwise, towards the Maintenance of the present War; which Sums of Money he shall dispose of to such Persons respectively, and to such Uses and Purposes, as are appointed by the said Act. It is thereupon ORDERED, by the Lords Spiritual and Temporal in Parliament assembled, That the said William Wetton be forthwith discharged from being under any Bail by reason of the said Arrest; and that the said Richard Symes and Henry Ryde be likewise discharged from their present Restraint for the said Offence, paying their Fees: And this shall be a sufficient Warrant on that Behalf. "That, according to their Lordships Order made Yesterday, the Judges have read over the Charter granted to the Spanish Merchants, dated 31° die Maii, 3° Jacobi; and the present Patent granted to the Canary Company; and also the Statute in 3° Jacobi, Cap. 6, for Enlargement of Trade; and they find in the said Statute, the Words to be, "The Dominions of Spaine," and not "The Dominions of the King of Spain." He further said (his Brethren being of the same Opinion), That a Place may be Part of the Dominion of the King of Spaine that is not Part of the Dominion of Spaine, as Scotland is Part of the Dominion of the King of England, yet no Part of the Dominion of England; and that there may be Islands and other Places of the Dominion of Spain which yet are not within the Continent of Spain; as the Isle of Man, though not Part of the Continent of England, is Part of the Dominion of England: But whether The Canary Islands be Part of the Dominion of Spaine, it being a Matter of Fact, they conceive it not proper for them to give any Opinion therein." Dominus Custos Privati Sigilli declaravit præsens Parliamentum continuandum esse usque in diem Sabbati, videlicet, 26um diem instantis Januarii, hora decima Aurora, Dominis sic decernentibus.